New Cloud-Sellers Orbi G3 and G4 tank cleaning machines are now shipping with a redesigned water motor. The cleaner, more minimalist design features removal of the stem and holes drilled to the exact size of the bypass plugs per specific configuration. This leaner design means less material and faster production throughput, allowing Cloud Company to continue to offer the best tank cleaning machines in the world at the most competitive price points. Cloud Company will be in Omaha, Nebraska for the 2018 Fuel Ethanol Workshop & Expo June 11 - June 13. Come say hello at booth #1201! Now in its 34th year, the Fuel Ethanol Workshop provides the ethanol industry with cutting-edge content and unparalleled networking opportunities in a dynamic business-to-business environment. Look for our new banner featuring Cloud founder Jim Rucker at booth #1201! In May, Cloud Company will celebrate its 10-year anniversary of the Sellers Cleaning Systems acquisition! Sellers has been in business since 1871, and in 1989 became Cloud Company's North American distributor after Cloud ended its relationship with former distributor, Sybron Gamajet™. In 2005, Crane Pumps & Systems (Sellers' parent company) decided to pursue the divestiture of Sellers, so it could focus on building their Pump products division. This divestiture was finalized in May 2008, when Cloud acquired Sellers and moved all manufacturing to San Luis Obispo, CA. Mike Kemp, the Sales Manager for Sellers, already having sold Cloud products alongside Sellers' from 1989 to 2008, continued in the same capacity with Cloud (where he is currently in his 35th year of service to the industry). Before acquiring Sellers, Cloud was the designer, patent holder, and manufacturer (OEM) for the Model 1804, and all versions of the Model II and III (sold through Sybron Gamajet™), and the current Model 360, 363, 180, 700 and SVRU family. The acquisition of the Sellers product line was a natural fit since it allowed for access to a broader line of Rotating Tank Cleaning Machines across all industries, an excellent customer base and sales network, and it resulted in a consolidation of manufacturing facilities in San Luis Obispo, CA. Beyond inheriting a fuller product line, Cloud Company inherited Sellers' rich history. Founded in 1871, William Sellers & Co (then Bankcroft & Sellers) started out as a machine shop, much like Cloud. Their first cleaning product was William Sellers' improved design of the Giffard Steam Injector, which became well known worldwide as the B, BX and BZ Steam Injectors. In the 1940's, the need for the elimination of manual cleaning, as well as improved overall cleaning, resulted in the addition of Tank Cleaning Machines which could be used with the Sellers Injector feed units, or pumps, for more efficient cleaning inside vessels. The first models developed were the 2" and 3" Troll Ball, following shortly by the Jumbo 6, for cleaning of larger tanks and vessels. The Tankman was designed in 1980, and the Orbi series and Tankmasters were designed in the 1990’s. The product line continued to expand in 2017 with the release of the Hygienic models. Today, we are proud to carry on a long tradition of continuous innovation and quality manufacturing in America. 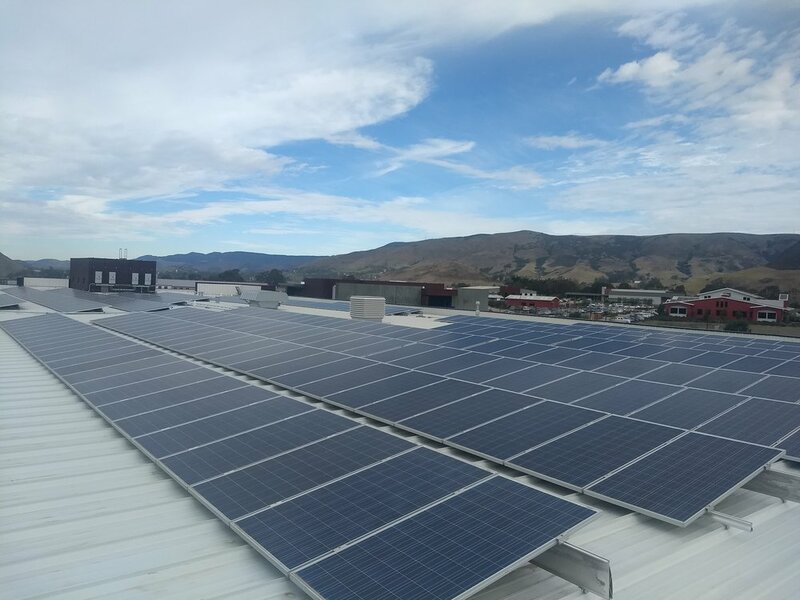 Cloud Company, manufacturer of the highest quality commercial tank cleaning machines, recently recognized the second anniversary of our over 400 panel solar installation at our factory in beautiful San Luis Obispo, California. 46,657 tons of CO2 emissions avoid. 7 million gallons of gasoline offset. 2.3 million nights of powering the Christmas tree at Rockefeller Center. Continued infrastructural improvements help Cloud Company keep operating costs in-check, allowing us to offer industry best pricing to our valued customers. After many months of R&D and testing - Cloud Company is excited to begin shipping our updated version of bevel gears for the Tankman, Jumbo 6 and Hygienic 80! 1. We have eliminated the sharp points on the outer diameter of the gears allowing easier and safer handling of the Tankman and Jumbo. Our assembly professionals really appreciate this feature and so will you. 2. A more robust supply chain. Gear cutting is a time consuming process that tends to create a bottleneck in production. By adopting this new approach to gear manufacturing we have reduced lead time substantially. Will these work with older gears? YES, the new and improved gears will work with the old style. There are no compatibility issues whatsoever. Here at Cloud Company, we believe success lies in continuous improvement and innovation. Small changes like these make it possible for us to deliver the highest quality tank cleaning machines at a better price while keeping jobs in America! NEW 2" TROLL BALL ON RIGHT AND ORIGINAL 2" TROLL BALL ON LEFT @ 200 PSI. Cloud Company is proud to announce the release of the Drum Major Extension. The DME allows for optimized positioning of the Drum Major's spray head for more effective cleaning of wine barrels and kegs. While this was designed from customer feedback from last year's Unified Wine and Grape Symposium, the Drum Major with DME is a great fit for a large number of applications. Hygienic Tank Cleaners Now Available! Cloud Company is now featuring three new Hygienic tank cleaners designed for a variety of applications in the brewing, chemical processing, food processing, bulk transport and pharmaceutical industries. These models are hydraulically driven by the cleaning solution for longer life and more reliability without any internal drive gears to worry about: ease of field maintenance!